CHAPTER I: Operator functions in Banach spaces. CHAPTER II: First order systems of ordinary differential equations. CHAPTER III: Boundary eigenvalue problems for first order systems. CHAPTER IV: Birkhoff regular and Stone regular boundary eigenvalue problems. CHAPTER V: Expansion theorems for regular boundary eigenvalue problems for first order systems. CHAPTER VI: n-th order differential equations. 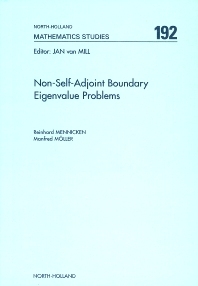 CHAPTER VII: Regular boundary eigenvalue problems for n-th order equations. CHAPTER IX: n-th order differential equations and n-fold expansions. This monograph provides a comprehensive treatment of expansion theorems for regular systems of first order differential equations and n-th order ordinary differential equations. In 10 chapters and one appendix, it provides a comprehensive treatment from abstract foundations to applications in physics and engineering. The focus is on non-self-adjoint problems. Bounded operators are associated to these problems, and Chapter 1 provides an in depth investigation of eigenfunctions and associated functions for bounded Fredholm valued operators in Banach spaces. Since every n-th order differential equation is equivalent to a first order system, the main techniques are developed for systems. Asymptotic fundamental systems are derived for a large class of systems of differential equations. Together with boundary conditions, which may depend polynomially on the eigenvalue parameter, this leads to the definition of Birkhoff and Stone regular eigenvalue problems. An effort is made to make the conditions relatively easy verifiable; this is illustrated with several applications in chapter 10. The contour integral method and estimates of the resolvent are used to prove expansion theorems. For Stone regular problems, not all functions are expandable, and again relatively easy verifiable conditions are given, in terms of auxiliary boundary conditions, for functions to be expandable. Chapter 10 deals exclusively with applications; in nine sections, various concrete problems such as the Orr-Sommerfeld equation, control of multiple beams, and an example from meteorology are investigated. "This book would be an excellent choice for an advanced graduate-level course in boundary value problems or as an indispensable reference for anyone working in the field. The book is self-contained. The writing is clear and the bibliography excellent." Richard Brown (1-AL;Tuscaloosa,AL). Mathematical Reviews, 2005.